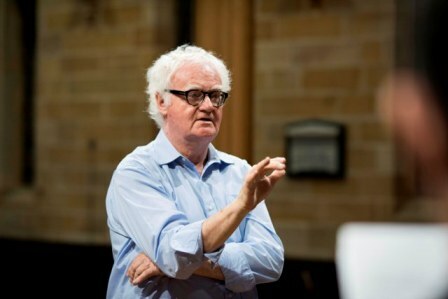 This morning I woke to the devastating news of the passing of Richard Gill. As well as his numerous achievements and inspiring advocacy for music and music education in Australia, Richard was a Patron of AUSTA. I have known him since his time in WA as Dean of WAAPA many years ago, he has conducted WASO several times, and along with others, I was fortunate to hear him speak eloquently at the AUSTA National Conference Brisbane 2015 and later at ASME presentations and on the media. Our AUSTA Executive will work hard to ensure that his memory is appropriately honoured by AUSTA. In the meantime, please consider the impact of his thoughts on you as a musician and teacher, and how you can best celebrate his legacy in your musical life. I would like to share a few beautiful images of Richard, along with an AUSTA orange floral tribute from our garden this morning where my AUSTA National Conference gift plant is thriving. At the end of this, I’ve included one of Richard’s messages, which I read this morning again on one of the many social media posts, this one from Tor in Canberra. I encourage you to read or re-read those inspirational words of advocacy, which we will also work on sharing more permanently on the AUSTA website in future.